Special Olympians Compete in Arizona Games - Featuring: Scorpions of Tucson! Mesa Community College - Mesa, Ariz.
Brenda Vas hits a backhand during the Skills/Drills competition at the Special Olympics Arizona Tennis Event. Almost	75 Arizona athletes competed recently at	a Special Olympics Arizona Summer Games tennis event held at Mesa Community College in Mesa, Ariz., on Saturday, May 2. Competitors from across the state, including teams from Casa Grande, Tucson, Yuma, Lake Havasu, Florence, Mesa	and Flagstaff all took part in the event, which USTA Southwest helped out with. Athletes competed in various skills drills in the morning,	then moved on to	tournament	play in singles and unified doubles draws as the day wore on. 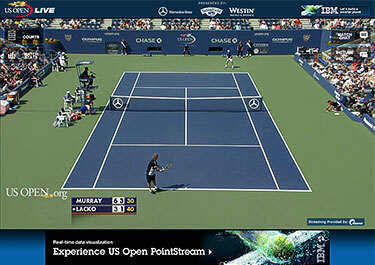 A competitive QuickStart Tennis draw was also included in the 2009	Summer Games, a first for the competition. Local Mesa Community College and Paradise Valley Community College tennis team members, a corps of Special Olympics volunteers, and five USTA Southwest staff members (Jessica Adams, Darlene Demory, Bill Lucero, Michelle Moyer and Jeff Sikes) helped feed and shag balls for participants, which ranged in ages from	teenage children	to older adults. A terrific time was had by all the competitors and volunteers. Jose Ramirez of the Flagstaff Hawks team tosses up this serve during the QuickStart Singles event. "I had a great day, and it was so much fun playing," said competitor	Alisha Herbert, of Mesa, who	participated in the singles draw. "I	played last year and will compete every year." A $500 USTA Southwest grant was given to Special Olympics Arizona	for equipment and to help stage the event, which is Arizona's largest competitive	event for adaptive	tennis. Tennis is one of 22 sports that Special Olympics Arizona puts on each year. The first Special Olympics Arizona competition was held in 1975 and consisted of a one-day track and field event with 100 athletes and 20 volunteers. Today, Special Olympics Arizona offers a complete range of sports, 170 programs in 15 regional areas, and five statewide competitions for 9,100 athletes and, 1,300 Class A volunteers and 5,000 day-of-event volunteers on an annual basis. For more information on Special Olympics or to volunteer, please visit www.specialolympicsarizona.org	or call 1-800-289-I WIN (4946). Once a week for the past decade,	a group of 20 players has shown up to practice tennis at the El Conquistador Country Club. 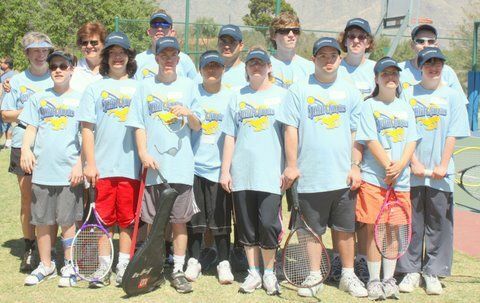 Named for Jennifer Fuchs,	founder of this 501C(3) tennis organization,	"Jen's Kids"	(now young adults)	has existed to serve the special needs population of Tucson. " We really need to change the name" said Fuchs, "they aren't kids anymore." She went on to describe the	program as a	"place where	players come to have fun, learn the game of tennis and feel a sense of belonging. Many of the players have played together for years so there is a strong feeling of	camaraderie among the group and healthy competition. These players really care about one another and when someone is not there, it is noted."